Take a nice girl. Make her don various head mounted displays. There, you've just invented a new fetish. Did I say the girl speaks only Japanese? 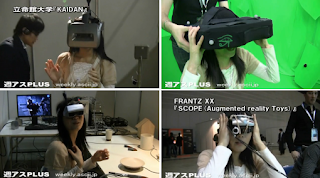 Filmed at SIGGRAPH Asia 2009 that ended today, the video below shows various AR and VR applications using head mounted displays. The reporter from ASCII magazine slays virtual samurai warriors in a game named Kaidan by Ritsumeikan University, draws with virtual ink on plates and plays with Franz Lasorne's war game. Head to ASCII to see all five videos it has taken at SIGGRAPH, including weird gadgets, augmented t-shirts (by Julien Pilet), a Micheal Jackson dance room and two more head mounted displays (one with cameras placed on your hands). Via Development Memo For Ourselves.